Engadget has a short article on Google's currently being rolled out update to Google Hangouts. Simpler interface, improved video quality, no apps. Yep, you read that right - those apps you love - and no, not the sound effects and the goofy hats, but apps like Roll20 - do not work with the new update. Just be aware that you may lose some features you like -- as one early adopter notes, app support within Hangouts is currently missing. That doesn't necessarily mean that the support is gone for good, but you shouldn't count on it coming back. The comments in the G+ thread are very interesting and there are some names many of The Tavern's readers will recognize. Dear God in Heaven, please don't make me play Roll20 through Lucifer's Broadcasting Service (aka Skype). The only way Skype could be more obtuse and frustrating were if it was run by Comcast. I've checked (you know, by logging into my Hangouts and running the new version) and Roll20 and all the apps are still there and functional. "We’ll be rolling out to a small group of users starting today and expanding globally in the days ahead. 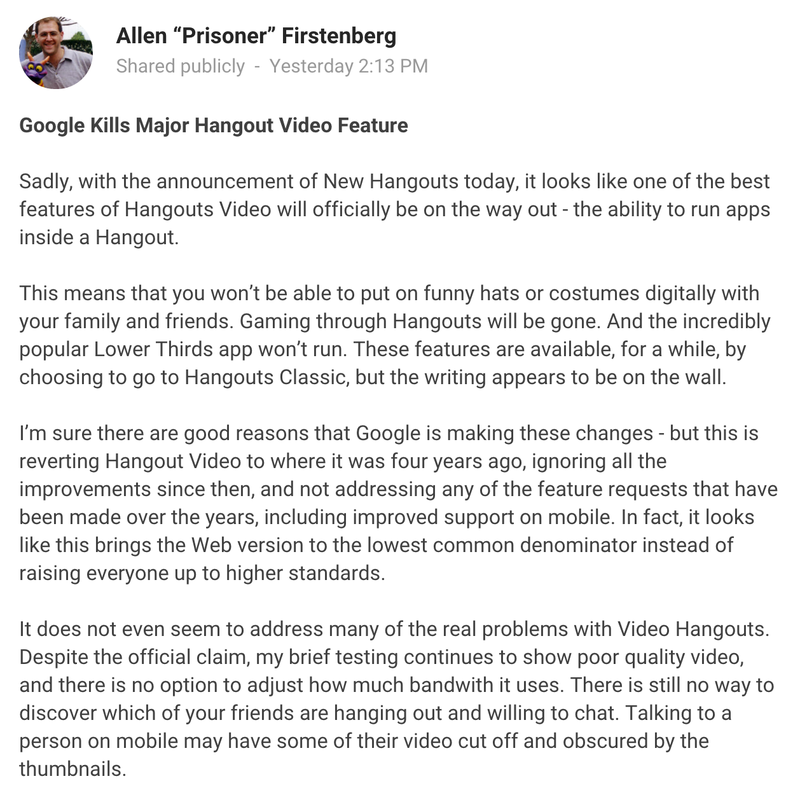 Keep an eye out and tell us what you think!﻿"
BTW, does anyone have a screenshot of the new Hangouts? 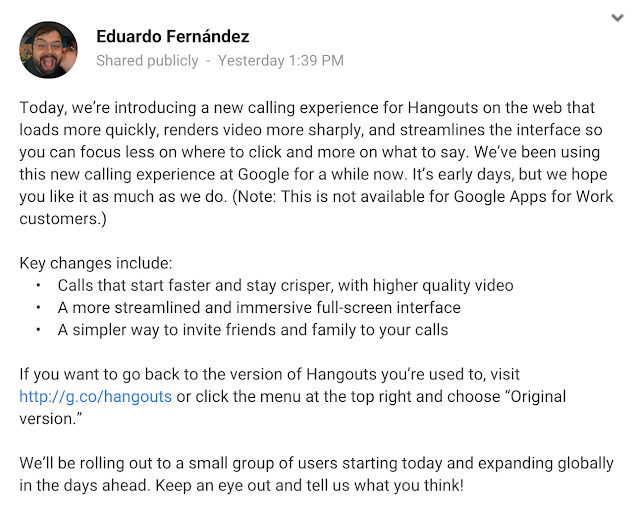 Apps for now will still launch in the old versions of the Hangouts even if you have been rolled out the new one. But it's basically writing on the wall that they are probably going to kill them off soon. You haven't been able to make new Hangout apps from the developer console for months now. Also Roll20 uses WebRTC and it has improved vastly since its first implementation. 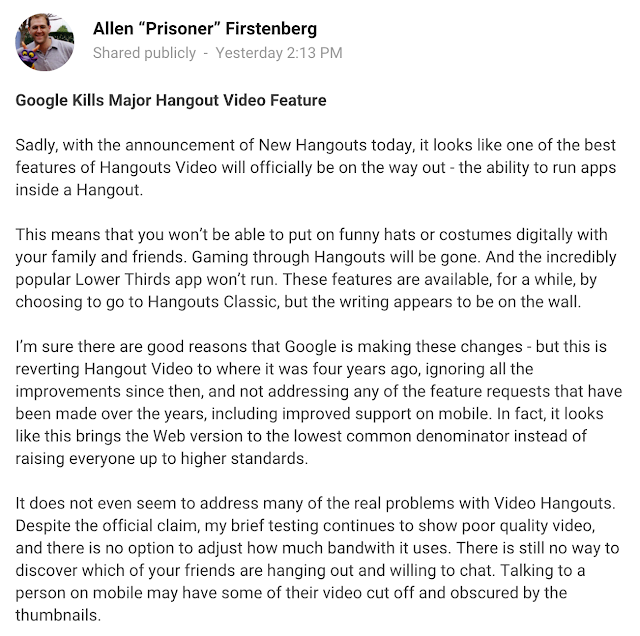 I still prefer Hangouts myself for the ease of use of inviting people, tying it to events, etc. but the internal video/chat is still pretty functional.